The Beocord 2400 represented the final version of this long running series. Externally, little had altered. The tape deck was now black (instead of silver metallic), the push button switches were now metal instead of plastic and all the bright metal parts were of a satin, as opposed to a polished, finish. The very observant may have noted that there were now two microphone sockets (to allow two mono microphones to be used as a stereo pair), a switch had appeared next to the headphone socket to allow the automatic stop system to be turned off and that the mains lead was now permanently attached (previously it had plugged in) and was stowed in a compartment in the base of the machine. Other details included a general tidying of the printed lettering and finally the level meters had proper scales calibrated in dB rather than simple “high/low” markings. Text copyright © Beocentral. Unauthorised reproduction prohibited. Inside however, the Beocord 2400 represented the largest change made during the development of this series of models. Although of a similar layout, the chassis was now die-cast (formally it had been made of pressed sheet) and the circuitry employed silicon transistors, a lower noise alternative to the germanium types that had previously been employed. An odd detail of this change was that contrary to normal silicon practice, PNP-type transistors were used extensively, along with negative power supplies. The built in power amplifier was now more powerful, producing 10W per channel. The automatic stop system was redesigned, and while the stop foil sensor remained in a very similar to that fitted to previous models, the mechanical tape-break switch was replaced with an optical device, which could be switched off if not required. The circuit for this, which had previously used a sensitive relay to operate the stop coil, now used a thrystor, a new type of semiconductor device that had only recently become available. Text copyright © Beocentral. Unauthorised reproduction prohibited. Tape heads of a new design were fitted. They were “parabolically ground” and claimed to offer better head to tape contact. 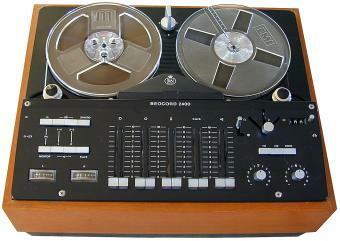 Improvements in the heads and in tapes meant that excellent performance was now available using the four-track format. The luggage cabinet was no longer offered, although the standard cabinet was largely unchanged. Text copyright © Beocentral. Unauthorised reproduction prohibited. Despite being effectively a development of a well established range, judges at the 1969 Hanover Fair awarded the prestigious “Industrie Forme” award to the Beocord 2400 for its outstanding industrial design. It would be the last of the line however, a new model was in development that was more compact and offered the possibility of vertical operation. This would later be launched as the Beocord 1600. Text copyright © Beocentral. Unauthorised reproduction prohibited.